Porsche has lifted the lid on its facelifted 911 GT3 RS, which will debut at next month’s Geneva motor show, and confirmed the track-honed sports car will hit Australian showrooms in the fourth quarter this year wearing a $416,500 (before on-roads) price tag. The “most powerful series-production 911with a naturally aspirated engine”, according to the German brand, the 2018 GT3 RS is $29,200 dearer than the model it replaces, and costs $89,700 more than the regular GT3 it is based upon. Nestled behind the driver is Porsche's 4.0-litre six-cylinder horizontally-opposed engine that produces 383kW of power and 470Nm of torque, which represents a 15kW/10Nm improvement over its predecessor that was launched three years ago. The increased output means the GT3 RS now runs the 0-100km/h dash in 3.2 seconds – 0.1 seconds faster than before. 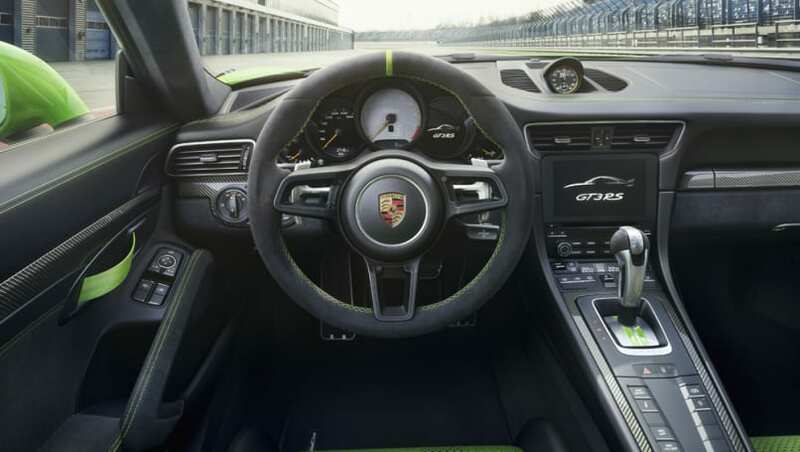 Top speed is also increased, with the seven-speed PDK dual-clutch automaticnow capable of pushing the car to 312km/h, up 2km/h. Whereas many cars in its category use turbocharger technology, the GT3 RS makes do with a tall 9000rpm redline and a linear power band that is, arguably, best achieved with natural aspiration. For handling, Porsche has recalibrated the car's rear-wheel steering system to deliver what it calls “maximum dynamics and precision”. The GT3 RS runs a double-staggered wheel set-up with 20-inch hoops wrapped in 265/35 tyres at the front and 21-inch wheels shod in 325/30 rubber at the rear. In terms of looks, the GT3 RS has picked up the 991.2 facelift that has been slowly rolled out across the 911 range that includes tweaked head- and tail-light designs, and restyled bumpers. On the inside, the car remains mostly unchanged, though an updated 7.0-inch PCM touchscreen multimedia system is now equipped. An optional weight-loss Weissach package includes magnesium wheels and replacement carbon-fibre components, which drop the overall weight of the GT3 RS to 1430kg. For racetrack bling, a no-cost Clubsport package adds a roll bar, fire extinguisher, six-point belt and battery disconnect switch. The new GT3 RS does not have a manual transmission option.